We were engaged. We were working hard. We were planning a wedding and our new life together. And one of the dozens of pre-marital conversations we had to have was – where are we going to live? There are several variables to consider when figuring out your living situation – income, location, expenses, goals, & positioning for the future. After much discussion we finally decided on the solution – a travel trailer. So several months before the wedding, we shopped around, found and purchased our rig. It wasn’t the most conventional decision and let me tell you, as much as I got on board with the set up, I had my reservations. I mean, a travel trailer? And we weren’t going to travel in it? Y’all, we don’t even have a truck to pull this baby with! I have to admit that since moving in and becoming a travel trailer dweller, I have been reticent to share this experience on the blog because, honestly, it wasn’t how I pictured it would be (more about that in another post). But I can’t tell you how incredibly grateful I am that we made this choice. In the long run, it has been one of the best (short term) lifestyle decisions we’ve made! Today I’m going to talk about 5 reasons why my husband and I decided to live in a travel trailer. 1. We wanted to keep our living expenses low in order to save money. One of our goals was for me to be a stay-at-home wife at some point. This opportunity came sooner than expected when I lost my job shortly before the wedding (real bummer). We decided I wasn’t going to go back to work and that was made possible by the trailer. Looking back, it has been a blessing and a challenge. Sometimes I’m glad I stayed home and other times I wish I’d just gotten another full time job. On the one hand, it was great for our home life but on the other hand, it sloooooooowed down our debt payment & savings goals. Thankfully, the benefit to a simple lifestyle, you have the room to experiment with options without major risk involved. But all was not lost – it turned out to be a great learning experience. While stay-at-home wifery is still the long term goal, we decided that I needed to pick up part time work for awhile. So I got a job last fall and that’s given a necessary boost to our income while still allowing me to work on my blog & YT channel and take care of home. 2. We needed to pay off (my) debt. I entered the marriage with debt; he did not. School loan & a couple of credit cards. That credit card debt was at the top of the list to go. And, with hard work, my extra income and the grace of God, we knocked it out of the park in January. Never doing that again lol. Now we’re chipping away at my school loan. 3. We own our home. Small though it may be, we own it. Let me tell you that starting a marriage with assets (we own our vehicles outright too) has been a major blessing when it comes to finances. We haven’t had to worry about a mortgage or car payments and we pay less than $500 on rent and utilities at our trailer park. I’m not saying we’ll never rent or have a mortgage down the line but for now, we have the asset. We always have the option to sell, putting a good chunk of money back in our pockets. 4. WE WANTED THE BEST POSITIONING. When we first got married, we simply just weren’t sure yet of where we wanted to settle and what that would mean for work and family. We didn’t want to tie ourselves to certain expenses while we figured it all out. So we opted for the lifestyle that would best position us to make those decisions when we’re ready. When all is said and done, ultimately we want to live unconventionally. Not full-time travel trailer life unconventionally but in other ways. We don’t want to live paycheck to paycheck. We don’t want to schedule ourselves around PTO forever. We don’t want to live with debt for a second longer than we have to. We want to build a business or two. We want to travel. We want to be in a position to give generously of our resources and not worry about making ends meet. And none of that happens overnight. That kind of life means making sacrifices now. 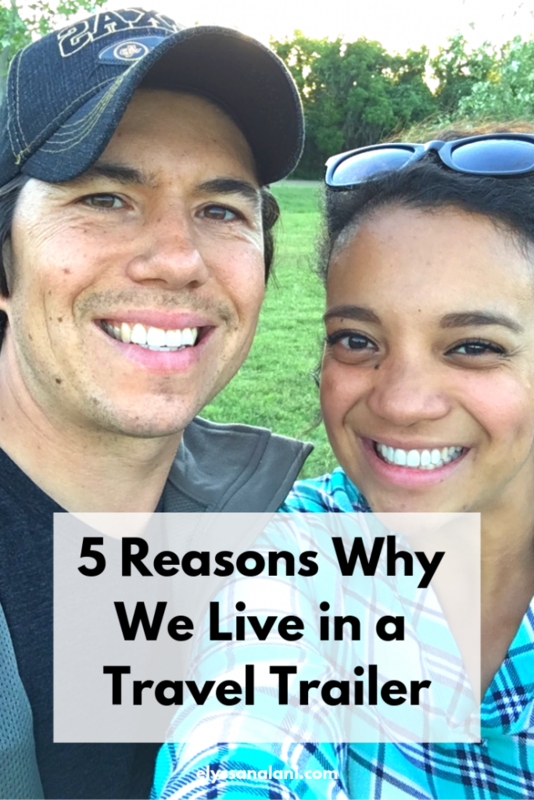 So those are the 5 reasons we chose to start out together in a travel trailer! I’m going to be honest, I have days where I’m itching to get out of this trailer. But then I remember that we have goals and if we’re going to meet them, I have to stick with it. I may not always like it, but when all is said and done, I’m so glad we chose the trailer!